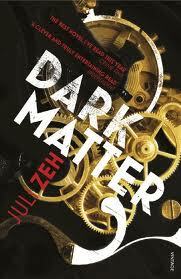 Dark Matter by Juli Zeh is one of three German books on the long list for the independent Foreign Fiction Prize. This in itself might suggest a renaissance in German writing, but what is even more encouraging is the variety that these authors offer. Where Visitation is intense and literary and Fame is witty and amusing, Dark Matter is an intelligent thriller with a liberal dose of physics thrown in. This is obvious from the punning title, dark matter being the undetectable matter theorised from its effect on what we can see, and a reference to the murder that will take place within the novel’s pages. The car, of course, is gone. This scene works well because Zeh has spent time establishing Sebastian’s character and his relationship with his son. It is also very easy for the reader to identify with Sebastian’s situation: he is quite unequivocal that he will do anything to get his son back, and this includes murder. This method, of course, works better in fiction than elsewhere. As with many literary thrillers, the intellectual padding, while necessary to the plot, is not really absorbed thematically. This is not, for example, a novel about the many worlds theory, its moral implications or its folly. For this reason, it is not quite of the standard of some of the other novels on the long list. It is, however, an engrossing and exciting read. 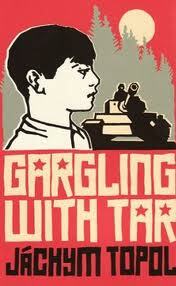 Gargling with Tar is the second of Jachym Topol’s novels to be translated into English (the first, City Sister Silver appeared ten years ago) and, as its striking cover may have suggested to you, it is set in Czechoslovakia during 1968 when Warsaw Pact forces prevented the country from freeing itself from the Soviet Union. As with Gunter Grass’ The Tin Drum, Topol adopts a child’s perspective on events which goes a long way to enhance the chaos and confusion of the time. Ilya’s multi-lingualism is later seen as a useful skill, allowing him to work as an interpreter and to escape from more than one dangerous situation. It’s an early sign that this is not a nationalist novel, and that Topol will present both sides of the conflict unflinchingly, to the point where the sides themselves seem to disappear. The novel is also full of myths and legends, appropriate to its setting in a forest. These centre on the national figure of Czechia, but also include the ‘dinosaur egg’ that the Russian commander wishes to take back to Moscow, and the wolf that Margash claims is his father. When a wolf finally appears it is “cringing” and “all thin and moulted”; and when Ilya rescues a girl who has been tied naked to a bath tub for the pleasure of soldiers, he thinks he has found Czechia. Almost everyone he meets is following some dream or personal mythology. 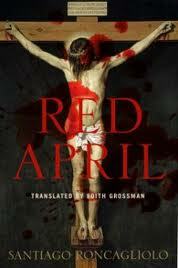 Gargling with Tar blends realism and surrealism to create a vivid picture Czechoslovakia in 1968. By having a narrator who is ideologically uninvolved but in a life or death struggle to survive, Topol places the focus on what it might have felt like to be there rather than adopt the safer perspective of history. 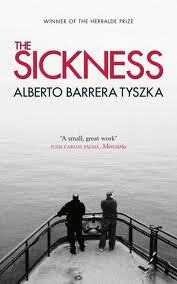 The Sickness, Alberto Barrera Tyszka’s first novel, cannot be accused of false advertising, being, exactly as it states, a meditation on sickness. There is not even any hint of the metaphorical associations that the word may have in English: this is a novel about illness and how we cope with it. Tyszka sets out to explore sickness through two linked stories. The first tells of a doctor, Andres Miranda, who discovers his father is dying from cancer; the second, told largely through a series of e-mails, focuses on one of Miranda’s patients, Ernesto Duran, whose belief in his own illness is at odds with that of his doctor. In this way, Tyszka examines not only sickness, but the relationships it creates. Tyszka immediately moves into Miranda’s father’s point of view, and the novel moves on to deal with the questions that arise when death is certain. While it’s possible that Miranda, as doctor, might have these quotations floating around in his head, and it illustrates a certain intellectual detachment in his character, it seems unlikely he would provide his own bibliography. That said, The Sickness is a thoughtful and, at times, moving novel, and well worth its place on the long list. Three German novels are featured, perhaps marking a resurgence in German writing, which hasn’t made much impact on the English-speaking market since The Reader. 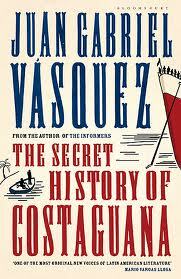 Latin American writers are also prominent again. Last year I attempted to read all the long-listed books and, having already read five of them, it’s tempting to try again, but, given that the short list is announced in three weeks, it’s not going to happen. However, I can’t help but be tempted by a few of them, and I’ll be posting my thoughts over the next month, perhaps adding a few more once the short list is announced. One I won’t be writing about at length is The Museum of Innocence (it is unlikely to win anyway – the prize does not tend to favour already well known writers). This is because I found it so disappointing when I read it last year, having both enjoyed and admired My Name Is Red and Snow. If you don’t know the book, it’s a love story in which the ‘tension’ is created by the inability of the lovers to make any of the decisions that would allow them to be together. It relies heavily on the cultural milieu of the setting, but whereas this is an enhancement in the work of, say, Jane Austen where it is portrayed with a light irony, here it is a cause of a rather heavy didacticism. Above all, the main character, Kemal, is so weak and foolish that you soon lose any belief that he can feel passionate emotion at all, though he persists in telling you at every opportunity. His wait for Fusun lasts many years, and Pamuk seems to have decided to mimic this with an interminable narrative that feels exactly like sitting in a small room waiting for something to happen. The only interesting idea was that Pamuk apparently actually created the museum, a collection of objects linked to Fusun – but having read the novel, you may feel that, rather than a post-modern masterstroke, this in fact is just an indication of a writer too close to his subject. 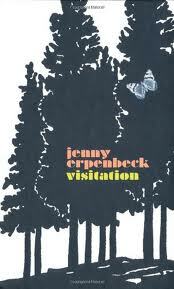 You are currently browsing the archives for the Independent Foreign Fiction Prize 2011 category.